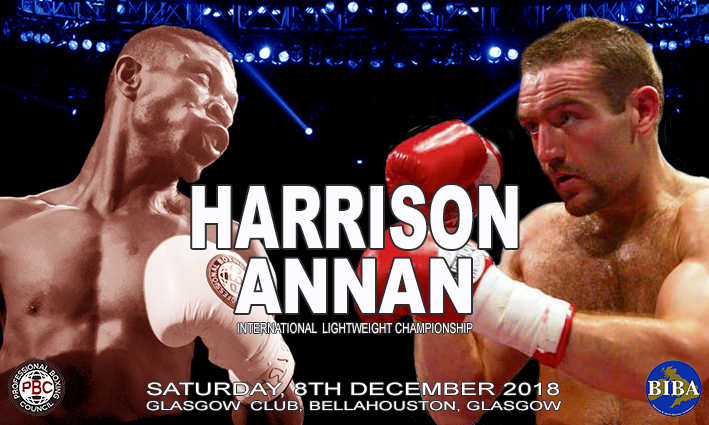 ﻿Two-Time World Champ Harrison Returns On 8th Dec – Faces Ghana’s Annan in Glasgow. On Saturday 8th December former two-time World Boxing Organization (WBO) World Champion Scott Harrison makes his welcome return to the ring, at the Glasgow Club in Bellahouston, Glasgow. Harrison (27-3-2, 15 wins via KO), who was released from prison in July after serving three years of a four-year sentence for assault in Spain, is set to face Ghana’s Tackie Annan (11-6-0, 10 wins via KO)for the Professional Boxing Council (PBC) International Lightweight Championship. Annan’s last visit to Scotland, back in October 2017,see the big punching Ghanaian knockout Aberdeen’s Nathan Beattie in the second round of their PBC Silver International Lightweight Championship contest at the Beach Ballroom in Aberdeen. Without doubt the choice of Annan for his return fight, after so long out of the ring, shows the Glaswegian’s determination to take meaningful fights in his quest to regain ranking for future World Championship accolades, as Harrison made clear when he spoke earlier today. “I’m really looking forward to the 8th December and getting back to work. I’ve not boxed in five years so it’s going to be a terrific night and I can’t wait. “I’ve not got a lot of time left, so I’m looking forward to enjoying the rest of my career and hopefully win the World title again. “To get in the position to challenge for my third World title I needed a good test on my first fight back, Annan’s proved himself, he won ten of his fights by knockout, including against Nathan (Beattie) last year. Posted in Championship News, News Tagged 8th December, Bellahouston, Daniel Adjei Sowah, Glasgow, IBF, International Boxing Federation, Lee McAllister, Nathan Decastro, Paddy Reilly, Professional Boxing Coucil (PBC), Sandy Robb, Scott Harrison, Tackie Annan, TKO Box Office, World Boxing Union (WBU) Leave a Comment on ﻿Two-Time World Champ Harrison Returns On 8th Dec – Faces Ghana’s Annan in Glasgow. Bardney, Lincolnshire’s Nathan Decastro (14-0-0) wholeheartedly believes it is his destiny to become World Champion. 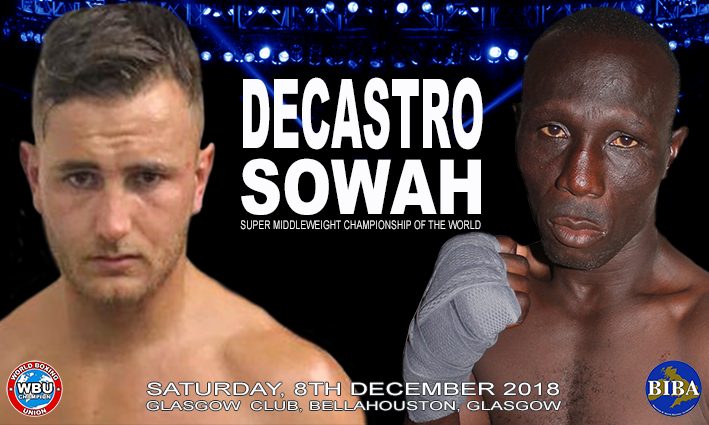 In just over a weeks time he finally gets the opportunity to make his childhood dream come true, when challenges Accra, Ghana’s Daniel Adjei Sowah (20-6-2) for the World Boxing Union (WBU), Super Middleweight Championship of the World at the Glasgow Club in Bellahouston, Glasgow on Saturday the 8th December 2018. Decastro, who is currently ranked #6 in the International Boxing Federation (IBF) Intercontinental rankings, earned the shot for the WBU World Crown with a solid points victory over West African Boxing Union (WABU) Champion Agoe Ashong (11-2-0) to secure the Professional Boxing Council (PBC) Commonwealth title at Pride Park in Derby back in September. Speaking from his home earlier Decastro could barely hide his joy at the opportunity to fight for his first World Championship. “I’m buzzing, I just can’t wait. I mean not only am I fighting for the World title, but will be fighting for it on the undercard of Scott Harrison’s return to the ring, exciting times. “My camps gone really well, I’m feeling fitter and stronger than ever. We’re not leaving anything to chance; we’ve covered every conceivable angle. “My father Frank has made sure of that, he’s a great coach, I really am blessed that he trains me. “We know he’s a banger, but so am I and what’s more I have a better KO ration of 11 in 14 against his 13 in 28 and more importantly I believe I am more hungry for this than him. “It’s been my dream since I started boxing as a youngster to win a World title and now I’m just over a week away from making my dreams come true. Decastro then went onto vent his frustrations over the way bureaucracy had thwarted his previous Championship efforts. “I’ve had a really frustrating year or so, yes I won the Commonwealth title last time out but twice this year I was supposed to challenge for the World title. “Unfortunately bureaucratic red tape caused the fights to be cancelled, either Visa issues came into play,as with the original planned fight against Agoe (Ashong) in July or worse still unnecessary political interference by the EBU, which scuppered the IBF European fight against Ronnie (Landaeta). “This time though it’s different, Daniel has his Visa and the EBU can’t possibly interfere, so no excuses. Nathan ‘Nightmare’ Decastro versus Daniel Adjei Sowah for the World Boxing Union (WBU) Super Middleweight Championship of the World, is the main support for the highly anticipated return to the ring of two time WBO World Champion Scott Harrison(27-3-2) against Tackie Annan (11-6-0) at the Glasgow Club in Bellahouston, Glasgow on Saturday the 8th December 2018. Tickets: Priced £60(Ringside), £50 (Outer Ringside) and £40 (Standard Seating) are available from the Assassin Boxing Promotions Ticket Line: 07594 144433 and on-line at www.tkoboxoffice.com. David Thomas on Kennerdale: It’s Going to be a War on Saturday Night!